The trip to Essaouria started at the Bab Dukala bus station. Let’s just say that this bus station is no Port Authority. Before we could find the bus heading to our destination, we were bombarded with men trying to sell us tickets on their particular buses to various destinations. We purchased tickets at the ticket counter for the cheapest bus out of town (40dhm one way). Our coach was dirtier than any Septa bus I have ever ridden on and the experience 10 times unpleasant. We were lucky to sneak onto the bus without paying for our luggage (so for those wishing to travel by coach just know that you have to pay for your ticket and your luggage). I left the majority of my things in left luggage and only traveled with my small backpack. This is the closest I ever will be to a backpacker. I’ve realized on this trip that I prefer modern accommodations and a fresh, daily change of clothes. Washing clothes out by hand, using non-English toilets, etc. is not my cup of tea. But back to the bus…we were one of the first people on the bus and had first dibs on the seats. We waited for close to an hour for departure and during that time, we were constantly bombarded with merchants boarding the bus trying to sell their wares: candy, water, jewelry, tissues, and desserts. They were intrusive and aggressive. In one instance, a young child made her way through the aisle with bottled water in tow. I told her no thanks and she took her attention from me to JB who was sitting in another row of seats asleep. When he didn’t respond, the young girl proceeded to tap him and tap him until finally he woke from his nap. A confused and alarmed JB jumped up and swatted the water away. I laughed hysterically. I was certain that the shoddy bus adorned with duct tape would lose a tire or break down on the side of road before we reached our destination. At 40dhm, this was not the express or direct bus. We stopped at just about every local village along the way to Essaouria. The stops were not announced, but for the most part seemed to be pre-determined. At times, however, the stops seemed unplanned and simply at the whim of the passengers as they yelled toward the bus driver and beat the roof of the bus until the bus came to a halt. Finally we reached our destination about 3.5/4 hours later and I couldn’t have been happier to disembark. The temperature outside of the bus was a welcoming contrast to the temperature inside of the bus; the bus was warm and Essauroria was breezy and a bit chilly. Essauoria like Casablanca is a coastal town which sits on the Atlantic Ocean. After a very short taxi ride to the center, we were met by a man who showed us to our apartment. I was nervous about the accommodations. I like to plan and pre-book things in advance. Furthermore, I like to read reviews about a place from several places such as Trip Advisor or Hotels.com. JB, on the other hand, is less of a planner and just goes with the flow. I was pleasantly surprised at the quality of the apartment. There was a normal bathroom (one which didn’t consist of a hole in the ground), a normal shower, and a fully fitted kitchen. Once we settled in, we walked around the town. Essaouria is undergoing major renovations throughout the town. Many of the sidewalks were being torn-up and therefore we had to walk in the streets which proved even more taxing to walk on. Construction started as early as 7:00am most mornings and lasted into the night. On some occasions, we could hear hammering past 11:00pm at night. 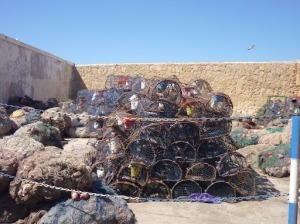 Our first stop was the docks where the fishermen were posted. JB thought it would be a good idea to buy some fresh fish and cook it. We looked over some fish and I decided that I couldn’t have fresh fish. I prefer to buy my fish already cleaned, without the head, and chilling on ice. We left the docks and headed to the central markets which were full of life – but nothing compared to that of Marrakesh. It was much more subdued and there were noticeably less people. We purchased fresh produce, fresh mint, meat, and other items we needed for our stay. That night, JB cooked a delicious tagine. My contribution to the meal included cutting the vegetables as well as washing the dishes. After I cooked breakfast, we walked along the coast. It was extremely windy and chilly. The cool temperature didn’t stop the visibly European vacationers from dipping in the ocean or laying out to catch some sun. We walked from one end of the coast to the other until we came upon some horses and camels. Somehow I got the impulse to ride a horse. I rode on a horse once in Girl Scouts – many, many years ago. As children, we are relatively fearless and don’t think too much about things like falling off the horse or broken bones! So, with the help of the guide, I picked a horse that was not only beautiful but allegedly calm. It cost 150dhm to ride the horse for an hour. JB opted not to take his own horse (thankfully) and whilst I held onto the reins, he took another rope and led me around the beach on the horse. 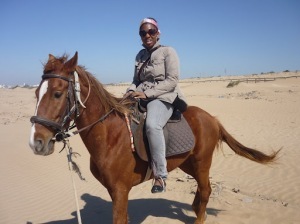 I refused to let the horse gallop through the sand or to go in unstable places. It was a relatively boring horse ride, but a different experience nonetheless. I was able to see some people wind surfing and other tourists riding camels along the beach. Once my horse adventure was over, we headed to the market again to buy more food for dinner and some wine. The liquor store was closed since Friday is the holy day. One of the things I thought before coming to Morocco was that alcohol was sparse and when available, hidden in some dark dungeons. However, there are plenty of stores that sell alcohol as well as restaurants that serve alcohol. I was told that although it is a Muslim country, it is more liberal than some other Muslim countries. However, public drunkenness is less tolerated than in Europe or the United States. 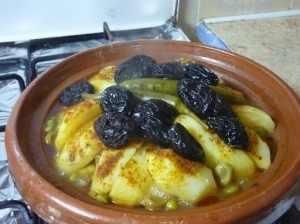 Sans alcohol, we gathered our food and headed back to the apartment to cook another tasty tagine. One of the locals heard me complain about the weather before embarking my horse the previous day and indicated that Saturday would be much warmer. So, I was excited to get out early, get some sun, and get some shopping done. That shopping really only included getting some argon oil and whatever else I came across that was not only affordable, but would also fit in my already jammed pack luggage. Before shopping, we walked around different parts of the town chatting and taking pictures. 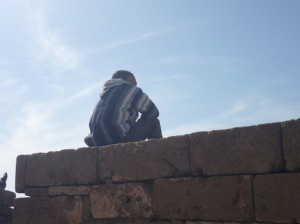 We sat for hours at a coffee shop around the corner from our apartment discussing our next stop to Ouarzazate. I updated my Facebook status, chatted with a few friends, and then we took off for the market once again. On the way, I purchased a gift for my parents and some argon oil. On the bus ride to Essaouria, there are fields of Argon trees where the prized Argon oil is extracted. In the town, I also spotted several stores selling shirts with the inscription “MarocStar”. The shirt had a man dressed in Berber attire carrying a surf board. When I went to purchase a shirt the man replied 200dhm and I thought that it was best I leave the shirt in Essaouria. The caption, however stuck with me. The man in the picture really captured the essence of Essaouria for those visiting the town for the first time. Essaouria was full of bohemians – tourists and Moroccans alike with long hair, sun-tanned skin, surf board and/or backpacks in tow. It has a totally different vibe than Marrakesh and Casablanca and not one that can be characterized as either old or new, but simple and serene. It was a blissful experience walking around and sitting out on the seat of the Atlantic. I was at peace and contempt with buying groceries at the market, walking around the beach, watching television, reading my book, and listening to music. I didn’t need any museums, clubs, or fireworks. 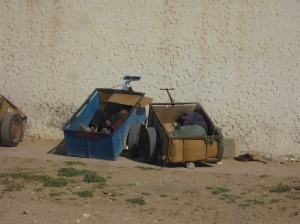 Essaouria simply was…the good life. I loved the picture of you on the horse as it really captured your carefree side.